The Blood Type Diet plan was put together back in 1996 by Dr Peter J D’Adamo. Dr D’Adamo is a naturopathic doctor and gained his doctorate from Bastyr College in Seattle, Washington. Naturopathy is a practice in medicine that looks for alternate cures without using drugs, for example, using exercise and diet. 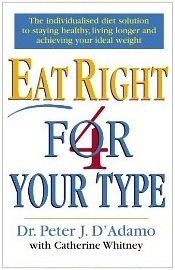 The series of books by Dr D’Adamo on the Blood Type Diet is fascinating work which explores why some people always look skinny, and others, no matter how hard they try, just cannot lose weight. The word, diet, does not refer to a calorie restriction, rather the food that we eat, although weight loss may occur depending on your existing diet. Every one of us is born with a blood type, either O, A, B or AB. Chances are you don’t know your blood type, and if you don’t, you won’t know which foods and exercise are suited to you, Dr D’Adamo claims. You can find out your blood type from your physician, doctor or use a Blood Type Test Kit to determine your blood type at home within minutes. Then you are ready to start planning a diet and exercise routine to suit you. Most people within 14 days of following the Blood Type Diet plan will feel more energetic, have improved digestion and have lost weight. In the table below you can find out what to eat for your blood type, exercise recommendations and your predisposition to certain health problems. Limit caffeine, alcohol, dairy and wheat. Ulcers/Stomach acid. Allergies such as hay fever and asthma. Arthritis, fatigue, weight gain and stress. Brisk exercise. Limit sugar, caffeine & alcohol. Cardiovascular disease. Low stomach acid. Gentle, e.g. yoga. Meditation to lower stress levels. Mix of vegetables, meat and fish. Specific foods create weight gain. Good digestion. Stress, and auto-immune disorders. Moderate exercise such as walking and tennis. Limit certain foods due to weight gain. Limit smoked/cured meats and chicken. Regular small meals. Cardiovascular disease. Poor digestion and stress. Combination of A and B. The characteristics of our blood type has developed over thousands of years, and understanding that history goes some way to explain why the diet and health characteristics are so. O is the oldest blood type, followed by A, then B, then AB. Blood type AB is a rare blood type, found in just 5% of the population, and is the most recent only having been discovered a thousand years ago. Your blood type will also determine your personality, but we won’t go into that as our focus is on weight loss, although we did test the blood type personality and health traits with the office staff, which was scarily accurate, suggesting the Blood Type Diet plan is to be followed. 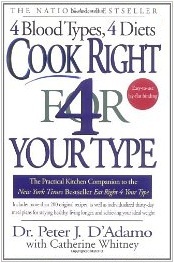 There are specific books and diets that have been written that focus on your specific blood type. Food choices are broken down further depending if you are Caucasian, Asian or of African descent. This is because each blood type is believed to have originated from a specific geographical area. Blood Type O = high protein, low carbs with lots of animal protein. Blood Type A = vegetarian. Blood Type B = variety. Lots of protein with some dairy. Blood Type AB = lots of vegetables with animal protein.